Cystitis is an inflammation of the bladder which causes painful irritation and an unpleasant burning sensation when passing water. 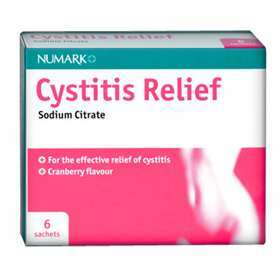 Cystitis Relief will make the urine less acidic and you should start to feel relief within a few hours. Take the contents of one sachet dissolved in a glass of water, 3 times a day for 2 days. Not recommended for use in men or children. If symptoms persist after the 2 day course is completed, consult your doctor. Do not repeat the treatment without medical advice. This product contains 939mg of sodium per sachet. To be taken into consideration by patients on a controlled sodium diet. This product also contains sucrose. If you have been told by your doctor that you have an intolerance to some sugars, contact your doctor before taking this medicinal product. You are allergic to any of the ingredients. If you suffer from heart disease, diabetes, high blood pressure. If you have ever had kidney disease; or if on a low salt diet. Each 5.53g sachet of granules contains: sodium citrate dihydrate BP 4.0g as the active ingredient. Also contains: Sucrose, Colloidal Anhydrous Silica, Saccharin sodium, raspberry flavour and cranberry flavour.